My family calls it the Look. You and yours may refer to it as something else, or not at all. But I know you’ve seen it. The Look is that, well, look people get on the last day of a Tahoe vacation. Maybe the car’s not yet packed and the morning breakfast dishes are still soaking in the sink. Maybe the souvenir sweatshirts are still hanging in the shop and the inflatable raft still has air enough to paddle out. Maybe the demo skis have yet to be taken back. But it’s there. The insufferable knowledge that this is coming to an end and that is out there waiting. It’s that that that is the Look. And maybe you rally. Maybe there will be one last supper, a big, family-style Italian feast. You will order the second bottle of Chianti during the antipasti course and you and yours will drink and laugh and tell stories well past when the tired children have crumpled like dirty dishtowels in the booth. Somewhere between the final sunset on The Lake and the sunrise clink of wine and beer bottles penetrating the blue bags like alien newborns; somewhere between the final brush off of the beach chair and the blast of the living room vacuum as a voice gives the wake-up-it’s-time-to-pack-up-and-go-home-sleepyheads call; somewhere between the last hand of blackjack and the “honey, did you already pack my contact lens stuff?” it is there. It is inevitable. It is the Look. The Look that you’re going back to whatever-that-is: the mortgage, the oil changes, the orthodontist, the kids’ magazine drives, the parent-teacher conferences replacing Friday happy hour, the soccer Saturdays (was I supposed to bring oranges this week?). The Look is going home to take care of the leaky washer, the endless parade of other families’ birthday parties, the run to Costco to buy three things but end up spending $300, the emergency pick-up from school. Um, lice. The Look is lice. Ultimately, the Look is wanting to be in the moment but failing to do so because we’re simply trying too hard. The Look is to revel in the memory even as we’re creating it, thereby ruining it. The Look is peering into the near distance to see the future us, even when it’s a future we don’t particularly want to see and are afraid to admit we don’t like. The Look is about not being in the now because we realize the now might be just too damn good. One winter in the early ’90s, while scouring the rental home for his glasses on leaving day, my father glanced up at my mother and they exchanged the Look. Two months later, the man whose every vacation growing up was spent in the back of his father’s Bel Air as it rumbled up Old Highway 50 bought his first home on the North Shore of Lake Tahoe. He stared the Look in the face and beat it. I eventually caught on and joined them for nearly a decade of life at The Lake. And ultimately, when those visitors lined up on I-80 or Highway 50 to go back down and hide in Sacramento and Oakland and San Mateo as we stumbled in to Treat Box for a mellow breakfast bagel sandwich before some turns, I gave the Locals’ Look. And that was it. Or so I thought. Last spring, my father was swinging a golf club in the late-winter shadow of a quiet afternoon where Highway 267 meets 28. His collarbone popped during the backswing on the first tee. A week later, a biopsy revealed lung cancer had crept into every important organ of his body and was going all in to take over his bones. This cancer wasn’t going to relent and it wasn’t going to be the good movie kind where you shave your head, start philosophizing really quickly and the end credits roll as the sun gently sets. It turned into tear-filled afternoons near Sacramento lying on the couch. 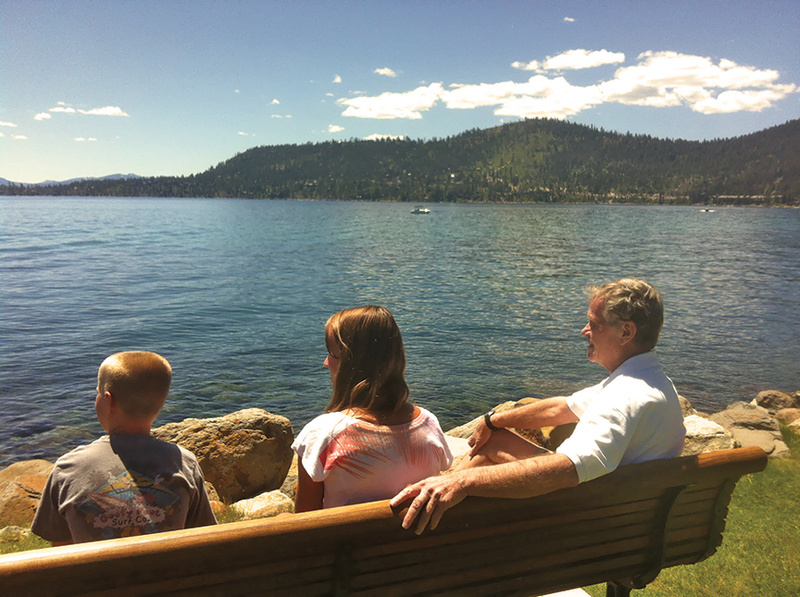 It was nothing but teeth-gnashing frustration as the man who simply wanted to breathe a little Tahoe air could not. The weekend after Labor Day, my father, who’d worked his whole life to lose the Look and live in the place he loved, was now a visitor. We took his boat out and drove it around the calm, empty lake. We went by the Cal Neva and then full-throttle across to the Thunderbird Lodge. As we pulled in to shore to take the boat out of the water for his final time, his eyes welled up. It was the Look, but unlike any Look I’d ever seen. He wiped his nose as a tear perched and fell from its bridge to join The Lake. Andrew Pridgen is a San Luis Obispo–based author who frequently spends time at his family’s Incline Village home.